The pink Peking/Beijing Marathon Lunarglide+ 2 is inspired by the Chinese Rose which is also featured on the insole. The instep highlights urban forms and grids by listing some of Bijings most popular places to run. The Lunarglide+ 2 is a fantastic new and improved version of it's predecessing running shoe, boasting all of the best parts with all new Nike features! It is a daily distance trainer offering top-tier performance technology to all changing needs. The new Lunar Glide has a better, gender-specific fit with seamless construction. There is a partial bootie construction for added comfort and fit. Reflective elements of the Lunar Glide increase your visibility and safety in low-light conditions. The LunarLite system blends plush cushioning and response for a smooth ride. The Dynamic Support system is adaptable to your stride and provides comfort and stability for underpronators up to moderate overpronators. 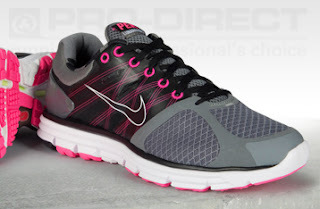 Lunarlon cushioning provides excellent shock absorption and responsiveness for a bouncy ride. A wedge of firm foam on the back-side of the midsole offers pronation support for those who need it. Brand NEW built-in Nike Flywire provides a stable fit and a lightweight lockdown to ensure your feet are properly supported to avoid impact or trauma. Nike+ ready, so you can keep track of your perfomances and keep improving your training.